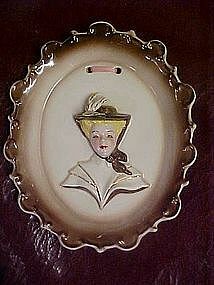 Lovely wall plaque of a vintage lady's head. Made by Florence Ceramics, Pasadena California. Plaque is hand decorated ceramic, and is in perfect condition with NO damages or repairs. Measures approx 7" by 6".